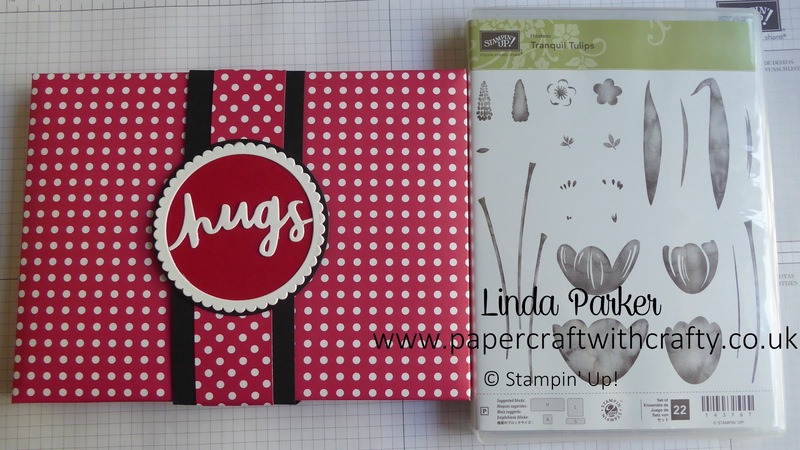 Linda Parker UK Independent Stampin' Up! Demonstrator from Hampshire @ Papercraft With Crafty : May Hostess Rewards - Tranquil Tulips ! Using the Hostess Code when you place an order is so easy and just look how some of my May customers have benefitted from doing just this ! When you apply my Hostess Code you automatically become a participant in my Hostess Rewards Club. I felt that a great way to kick off and celebrate the new catalogue was to gift this fantastic new stamp set to my May Hostess Code participants. Of course, I couldn't send out such a lovely set without some funky and stylish packaging. So out came my Envelope Punch Board and then old met new ! I used up some of my retiring DSP (Designer Series Papers) and the fabulous new Lovely Words Thinlits Dies, together with my Layering Circle Framelits Dies and created these useful DVD wrappers/holders with the help of a great video tutorial by Stampin' Up! demonstrator Tracy May. See her tutorial below. The wrappers are the perfect size to hold Stampin' Up! clearmount stamp sets. So if you are shopping with me - please try to remember to use my Hostess Code. This month it is QJNHGEQC. Thank you for stopping by today. If you haven't done so already, I would love you to subscribe to my Blog.